Picanto is available in 10 different colors - Titanium Silver, Alice Blue, Milky Beige, Aurora Black Pearl, Celestial Blue, Honey Bee, Lime Light, Pop Orange, Sparkling Silver and Shiny Red. Watch latest video reviews of KIA Picanto to know about its interiors, exteriors, performance, mileage and more. Over the years, Kia has been gifting the world with its exquisite and desirable passenger cars. Kia Picanto, the 5 door hatchback, is no exception. Ever since its inception in 2004, the car has been performing well on sales chart worldwide. Kudos to the manufacturers who have lauded this small family car with advanced features, eco-friendly technology and adorable design which creates refined individuality of Picanto. The car is the best to buy option for the Hatchback enthusiasts who seek for a blend of sporty yet easy to handle vehicle. Coming to the interior segment of this mini car, it is adorned in the presence of blackish-tinge covered seats which accentuates the elegance of the car maintaining harmony with other interior segments. In addition, gray colored inserts of detailing has been integrated to steering wheel, dashboard, gear shift knob and below AC vent lining. Entertainment segment is embedded in audio, USB port, iPod connection and SD card through which you can enjoy your long drives. Apart from this, to store your luggage, boot space of 200 litres is offered by this mini car which can be further expanded to 605-litres with rear seat folding functionality. The cabin is employed with plenty of mini storage compartments to store your belongings, including 9.6 litres of glove box, door map pocket, centre console, seat back pocket, rotating dual cup holder and under seat storage. The 5-door hatchback by Kia is designed with overall dimensions measuring 3595 mm x 1595 mm x 1490 mm (L x W x H), along with the standard wheelbase of 2385 mm. Sporty and appealing, this new Picanto defines is dynamism with exterior inserts and detailing. Embellished with stylish urban headlamps at the front, along with modest bonnet and radiated tiger roar grille with chrome finish enhances the front facade of this hatchback effectively. The company insignia at the centre exudes its signature front facade. This pleasing hatchback comes fitted with variety of alloy wheels of size ranging from 13-inch to 15-inch. Due to its short and conventional design, it appears adorable as well as charming at times which is a best-fit car for driving around. Picanto not only delivers the optimum driving experience, but also offers a fine blend of power and decent fuel economy. For UAE buyers, this mini car is made available with three petrol engine variants including Kappa 1.0 MPI, Kappa 1.0 FFV and Kappa 1.2 MPI. The maximum power delivered across all the 3 engines ranges from 69 PS at 6200 rpm to 87 PS at 6000 rpm and the peak torque reached ranges from 94 Nm at 3500 rpm to 120 Nm at 4000 rpm. The car doesn't offer an exhilarating acceleration but still it picks up decent numbers. With the 1.2 litre MPI engine, you can accelerate from naught to 100 km/hr in 13.5 seconds clocking a top speed of 169 km/hr. Despite offering a decent power, the car delivers an appreciable mileage of 20 kmpl which makes it stand tall among its segment of cars. Beneath its contemporary body style, the Kia’s engineers have loaded Picanto with latest class-leading safety measures. It is designed with the template of absorbing impact energy, and transfers it to the releasing pillars, contracting the fatal effect of any accident or collision. Its passive safety aspects includes six airbags system inflates instantaneously to reduce the accident’s impact. For firm braking, Picanto comes outfitted with all-wheel disc brakes which is further accentuated with Hill Start Assist (HSA) preventing rolling back of the vehicle. Talking about its suspension, this car is employed with McPherson Strut with stabilizer for front axle and torsion beam for the rear. 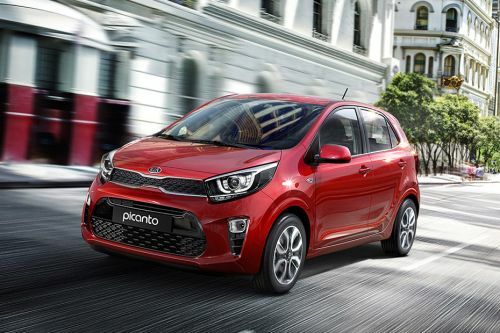 Consequently, Kia Picanto is one of the most affordable cars available in the UAE auto markets, which also provides you with well-equipped cabin exuding the classy touch of its interior. But its unsatisfactory steering might disappoint you a bit. What is the price of KIA Picanto? On road prices of KIA Picanto in starts from AED43,000 for base variant 1.2L Base, while the top spec variant 1.2L Top costs at AED49,900 . What are the colors options available in KIA Picanto?